I imagine they were specially dyed for someone’s wedding but now they’re mine! 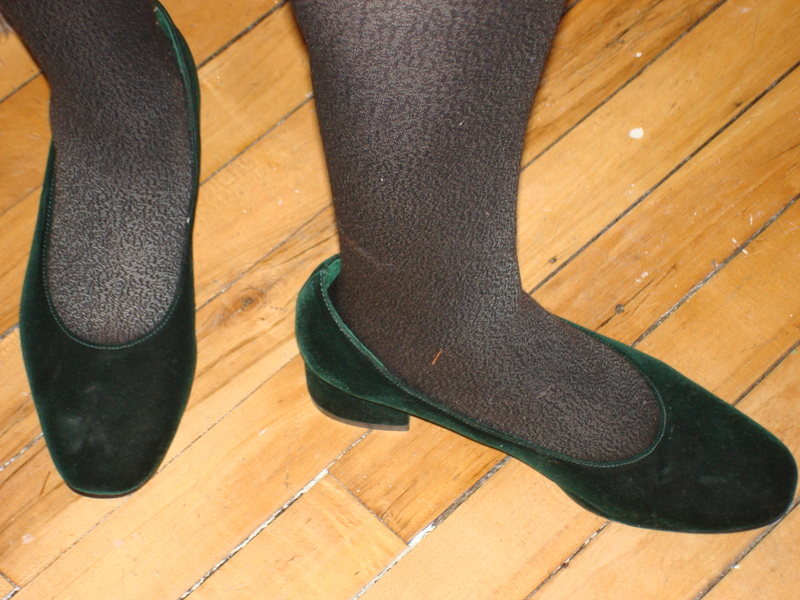 Green velvet shoes. Who would ever buy such a thing. Me, apparently. I love them. I wore them to work yesterday, and they were awesome! I went to Savers looking for black or navy shoes and then there these were. Three dollars! Great shoes! I would wear them at least until April! I wouldn’t wait for the perfectly matched green items were found…how about with a black or chocolate brown outfit? Thanks, I never thought of brown, only looked at my greens. I will have to dig through my closet. Plus, I do have some chocolate brown velvet in my fabric stash, maybe I will have to pull it out. Thanks for the idea! Very smart! I think they’d look good in dark Blue or Purple too. Thanks. I have definately have some closet exploring to do.